Edward Moore "Ted" Kennedy (February 22, 1932 - August 25, 2009) was the Senator for the U.S. state of Massachusetts from 1962 to 2009. 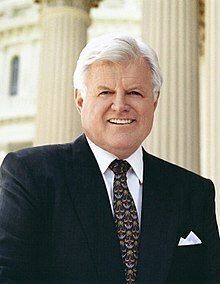 Ted Kennedy was born in Brookline, Massachusetts, which is a neighborhood in Boston. He was the youngest son of Joseph P. Kennedy, Sr. and Rose Fitzgerald Kennedy. He was the younger brother of former President John F. Kennedy and Senator Robert F. Kennedy, both of whom were assassinated, as well as Joe Kennedy, who was killed in World War II. A lot of other sad things happened in his life: he almost died in a plane crash, he was involved in a car crash that took the life of a campaign worker, and one of his sons had cancer as a child. Ted Kennedy went to Harvard and served in the Army before entering politics. He ran for and won the seat given up by his brother when he became President. While in the Senate, he fought for the working class, mainly for health care and the minimum wage. In 1980, he ran for President, but lost in the primaries to Jimmy Carter. On July 18, 1969, Senator Kennedy and passenger Mary Jo Kopechne were driving in Chappaquiddick Island where the car crashed over the bridge into the ocean. Kennedy left the scene leaving Kopechne to drown to death as she was trapped in the car. Kennedy plead guilty. Many believe this is why he decided not to run for President in 1972 or 1976. In 2008, he found out he had glioblastoma, a rare form of brain cancer. Despite the cancer, he campaigned for Barack Obama and sometimes appeared in the Senate. He died from the cancer at his home in Hyannis Port, Massachusetts just before midnight on August 25, 2009. ↑ "Kirk to be named interim senator". ↑ "Ted Kennedy's Personal Finances". opensecrets.org. 2006. ↑ "Ted Kennedy Dies of Brain Cancer at Age 77". ABC News.